For the best bounce house rentals Salt Lake City has to offer, Jumpin' Jack Splash just can't be beat. We are constantly acquiring the latest and greatest units for our customers. 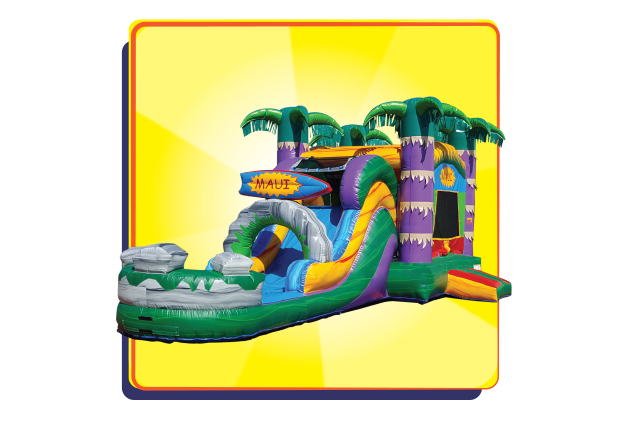 As a company that prides itself on providing the cleanest, safest inflatables in the area, it's easy to see why Jumpin' Jack Splash is Salt Lake City's #1 choice for inflatable rentals. Whether you're having a backyard birthday party, a school field day or a corporate event, these bounce houses will provide hours of fun and help create fond memories that will last a lifetime. One of our newest bounce houses is our Tea Pot Combo. Perfect for a tea party with your best friends. Looking to turn your backyard into a tropical oasis? Then take a look at our Maui Combo. Complete with beautiful palm trees, your guests will be transported to a beautiful island setting, right here in Salt Lake City. With so many great bounce houses, you're sure to find the perfect one for your next party or event. Thank you for looking and we look forward to serving you. Click below for the best bounce house rentals Salt Lake City has to offer.